Hydro-Force Professional Leather Cleaner is specially formulated to deep clean even the most stubborn dirt, soil, and spills from protected and aniline leather. It meets or exceeds the performance standards of leading Italian leather cleaners with a more economical price. It is easy to apply and easy to use. It works effectively on soils, spots and spills without the use of damaging and harsh chemicals that dry and stiffen leather. It gets deep into the grain of the leather and emulsifies, dissolves, and deflocculates dirt and oil that builds up over time. It is pH balanced specifically for fine leather and will not damage your protective finish. 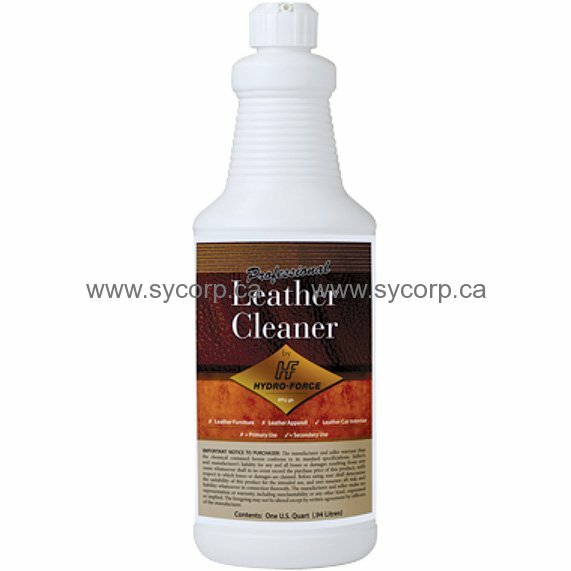 It is the perfect leather cleaner for your customer's fine upholstered leather furniture, but can also be safely and effectively used on auto leather, leather jackets, luggage, handbags, and more. Hydro-Force Professional Leather Cleaner will remove many common household spots and spills from protected leather.